How about cider, wine or spirits? If so, check out the most unique event in the Northwest. The Bridge to Brews 10K and 8K has been around for years, but for the third straight year we offer a beer tasting festival after the event, with each participant receiving a commemorative cup and 10 free tasting tickets! There are tons of great local breweries, distilleries and wineries to choose from. 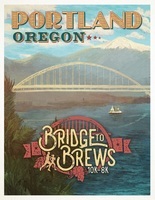 Adding to the uniqueness, this is the only running event that goes over the beautiful Fremont Bridge! There is food and live music at the finish, great support and music on the course and much more!